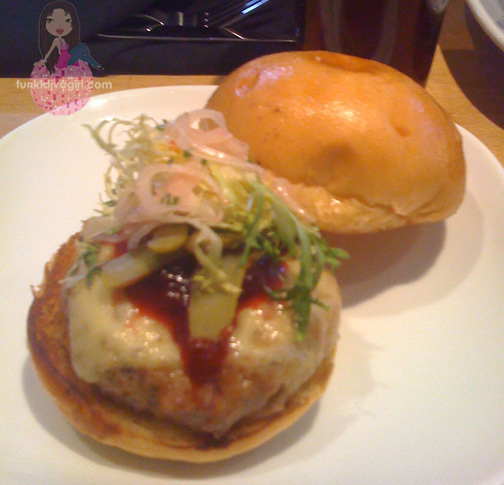 A great new guest blogger on Funkidivagirl.com wrote a review of Flip Burger Boutique. I would like to introduce my 13 year old son, Captain Cuisine. Captain Cuisine is a real foodie; he loves to eat and he loves to eat well. It is a (not so funny) joke in our house that he can always be counted on to order the most expensive thing on the menu. Captain Cuisine appreciates a good meal and always has much to say about his dining experiences. Everyone loves a critic! A little bit past the Wal-Mart, right across the street from an auto repair shop is Flip Burger Boutique, the newest concept by Top Chef runner-up and Atlanta restaurant media darling, Richard Blais. 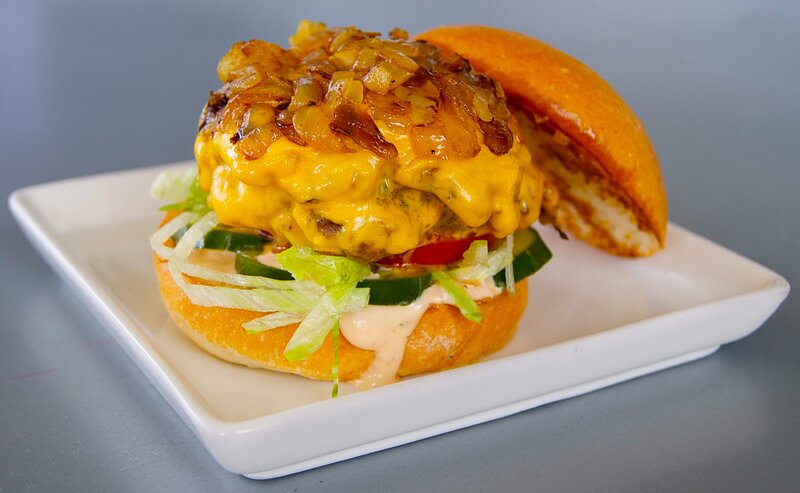 Flip is a quasi-upscale burger joint located in Atlanta’s Howell Mill district. The menu features twists on regular beef burgers, most of them not containing beef at all. Many of Chef Blais’s previous ventures have been short-lived (definitely not because of food quality), but this one looks like it’s here to stay. The burgers are pricier than your average fare, but you get your money’s worth and maybe a bit more, considering the sophistication. I arrived at the restaurant with my mother, father, and sister on a Saturday at 5:00. I instantly noticed that the atmosphere is very lively and family-friendly. Outside, there is a patio that will be very pleasant during warm months. As you walk inside, techno and new wave music greet you. The tunes may be slightly abrasive if you do not share those musical tastes, but they are not so loud that you cannot hear yourself talk (*cough* Two Urban Licks). Along the full bar is an alternating pattern of framed mirrors and framed flat-screen TVs, culminating in a framed cutout of the kitchen. Two long communal tables stand in the center of the diminutive restaurant while four person tables and ‘flipped’ booths lurk around the fringes. The menu makes you flip it around to look at different sections; which was slightly annoying. Our waiter was very well informed about the menu and we learned that Chef Richard Blais has created over 30 unique burgers to put into rotation for the menu specials. After a brief family meeting, we decided to get two milkshakes to share, an order of fries, an order of sweet potato tots, and our personal burgers. My mom Funkidivagirl decided to get the Codburger, my dad Keyinfluencer chose the Shrimp Po Boyger, while Girly opted for the classic Flip burger. I was in a quandary, stuck in a seesaw of confusion, both Pâté Melt and Lamburger vying for my taste buds. Ultimately, I decided to be more adventurous and try the Pâté Melt. The service was quick. First up was the milkshakes, frozen by liquid nitrogen, a chemical that causes rapid frostbite. The milkshakes available are: Krispy Kreme, Sweet Tea (not available at time of review), Nutella-Burnt Marshmallow, and Pistachio-White Chocolate. We chose Krispy Kreme and NBM. The Nutella just tasted like a thick chocolate and while it was delicious, it paled in comparison to the Krispy Kreme. The milkshake tasted exactly like its no-frills namesake in liquid form. One milkshake is split into two 8 oz. glasses, so we were satisfied. However, only for the purposes of the review did we get two milkshakes, for they were pricy at $7.00. You can decide whether it’s worth it or not. 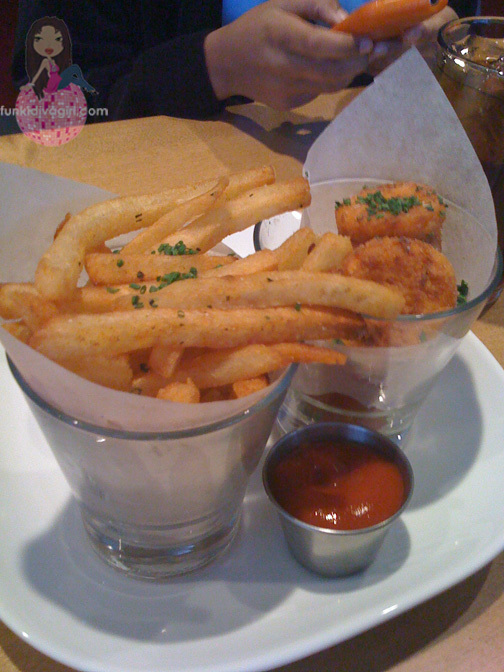 The next course was the fries and tots. The tots were good, but were way too salty and left me disappointed. The fries, however, were the best I have ever tasted. They were a rich orange color that intrigued me at first sight. Their life begins as fresh potatoes. They are then flash fried and frozen with liquid nitrogen. The frozen fries are deep fried in duck fat as needed. The end result is a french fry that is long and thick, but the inside flavor is smooth and consistent like a thinner fry. Partnering with the sides was blue cheese foam. The foam was created from blue cheese in the same dispenser as the Starbucks whipped cream. The foam had the same flavor as a normal blue cheese sauce, except that it was lighter and more whimsical. However, after about 20-30 minutes the foam got liquidy at the bottom, so savor it, but don’t take forever. The burgers arrived in splendid fanfare. Everybody around us paused their conversations to sneak a peek at our food. The food was arranged beautifully with the top bun uncapped. Portions were not slider size, but you would not feel disgusting if you ate two; my party was fine thanks to the milkshake and fries. Taking a glance at the food across from me, I decided that I was going to exercise my food critic mooching abilities before I ate my own burger. I started with Girly’s burger to see what the bar was. It was high. Not the best pure beef burger I’ve had, but it wasn’t trying to be. It was good but did not need to be great for the purposes of this restaurant. It got its job done in the way it needed to. 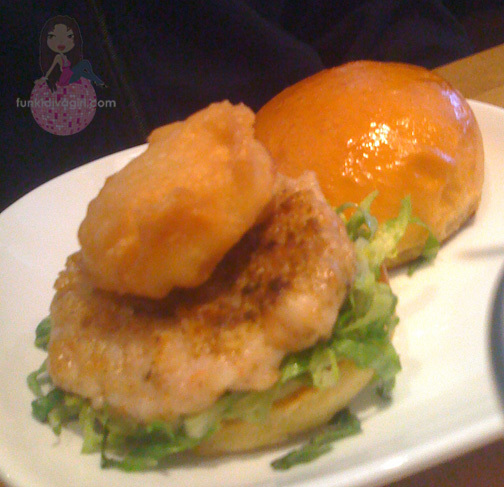 Funkidivagirl opted out of the tartar sauce on her Codburger, and it was still delicious. It was a meaty, yet light cod filet. The malt vinegar kept me on my toes and kept it interesting. The Shrimp Po Boyger was the star of the evening. It was a patty of shrimp in a sort of crab cake form, but it was the old bay mayonnaise that set it off. 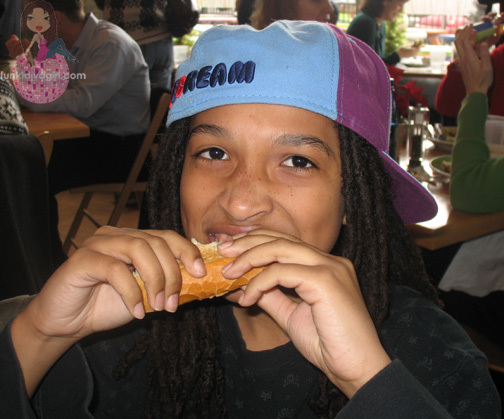 It tasted exactly like a Po Boy. The surprising twist that seems to be a theme in these burgers was the fried lemon. Yes a fried lemon. My Pâté Melt made me want to grow a handlebar mustache, I felt so sophisticated. The pâté was not the kind that was a pasty spread. My waiter assuaged me and said that a pâté can refer to any blend of different meats. The meat was very hearty, unlike the other burgers. The mix of veal and pork was very intriguing and each bite was flavorful and unique. As you continued past the first delectable bite, it was a pleasure when you came across lingonberry sauce. Lingonberries are a type of berry that is grown in Scandinavia (or Ikea). They are similar to cranberries, packing the same super nutrients. It is commonly paired with game. 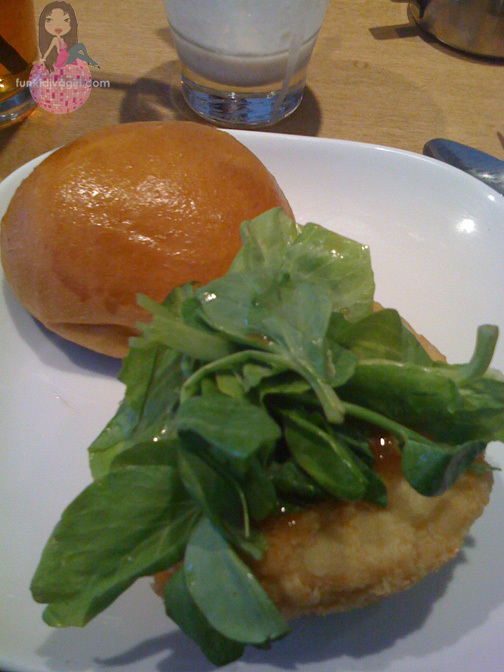 My only complaint about the burgers was that although they were delicious, special buns to suit the taste of the different burgers would be nice. Overall the burgers were great. They were not trying to be the heartiest burgers, just the most creative, and they got the job done. After my meal, Chef Blais visited every table, talking with his patrons. When he stopped at ours he learned about my impending review and took me on a tour (“Buttering up the food critic,” he said). He was very kind and showed me the giant vat of liquid nitrogen in the back; he also gave me information about the fries that I utilized in this blog post. I believe that by making the rounds to the tables, this alone could sustain the restaurant, as he was very funny and actually started conversations with people. After I thanked Chef Blais and returned to my seat, I decided to check out the bathroom. The bathroom was small but utilized the space very well, similar to the rest of the restaurant. The same mural that adorned the far wall of the outside room and the website was also in the bathroom. The bathroom was slightly bigger than gas-station size, but was very clean and sported a very cool sink that was extremely wide and flat. Flip Burger Boutique is an amazingly creative mid-scale burger joint created by a great man in Chef Richard Blais. I definitely am going back to try the Lamburger, though the Breakfast Burger looks good and Keyinfluencer went a second time and recommended the rBQ. Although it had a few wet-behind-the-ears kinks to work out, with time Flip could be recognized as one of the best dining places in Atlanta. Out of 5 Stars: 4.7. 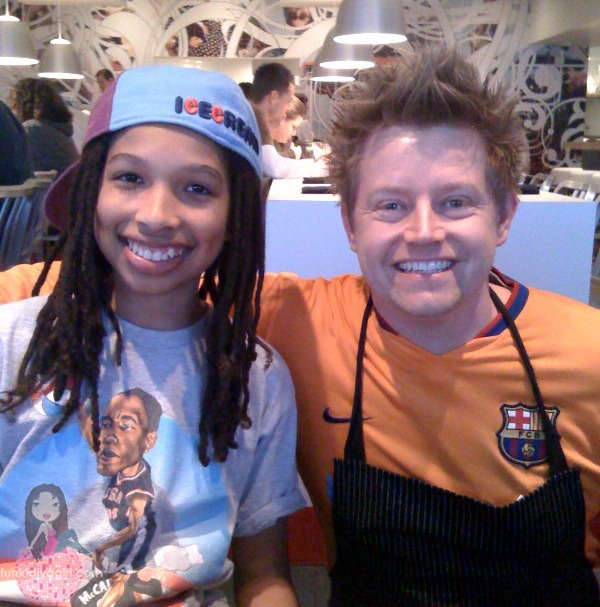 *A special thanks to Chef Richard Blais for taking me on the tour of the restaurant. You may also like to read this review of Ann’s Snack Bar Ghetto Burger. I totally trust your taste as I know how much you love the best food!! Great job and we will have to go together so you can school us more. Wphew !! glad we did a good job. Now your cover is blown and we will be looking for you !!! Wow…thanks for the great restaurant review..definately plan to go. My family and I will let the Chef know its because of your blog! This is a wonderful and comprehensive review. I can’t wait to read more. Impressive! I know who to go to when Mike and I want to go out. Great job Elijah! You def have a career ahead of you, cousin. I am impressed that at 13 you use words like assuaged 🙂 GOTTA LOVE YA! Well,well. It’s about time that we (potential patrons) receive this kind of indepth, valuble and well presented info. I will definitely check it out.